As announced in the April Issue of the Young Ace Magazine (Kadokawa Shoten Press), Mamoru Hosoda, creator of Summer Wars and the Girl who Leapt through Time will release an anime adaptation of the manga Ōkami Kodomo no Ame to Yuki. Hosoda, who wrote the original plot as well as the screenplay, will also direct the said animation. This January, the team released a 50-second trailer and announced that the movie will be shown in theaters on July 21 throughout Japan. Popular illustrator Yuu has created the artwork for the manga, and is furnished with Yoshiyuki Sadamoto’s character design. The film promises a warmhearted family themed plot, which starts with the 19 year old college student Hana and her encounter with a strange man. It was a surprising discovery that this man is no ordinary human—he transforms into a wolf! Winding up with a fairy-tale like love for a contemporary time, Hana and her beloved marries and gives birth to two wolf kids. Yuki, literally meaning as snow, the eldest, was born in the time of heavy winter, and Ame, meaning rain, is the younger brother and was born during a rainy season. However, sorrow begins as the wolf-man dies, and Hana moves into a rural part of their region to live a peaceful life with her kids. Casted along this fantastic animation are Aoi Miyazaki and Takao Osawa. Miyazaki is no newbie to voice acting, as she had contributed to other adaptations such as Someday’s Dreamers and Colorful. Osawa has also done his dubbing part in Jin and Tsukiji Uogashi Sondaime. They will be playing the roles of Hana and the wolf man, respectively. This will be the first time that these two actors have been casted together in the same production. Osawa marks this performance as his 44 years of voice acting in a feature length animation. The gentleness of Miyazaki’s voice, as well as the distinct deep tone of Osawa’s, greatly impressed Hosoda, the movie’s story maker. 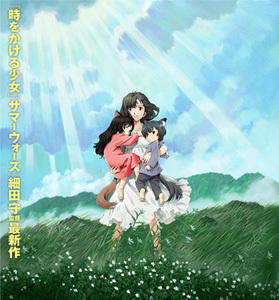 Ōkami Kodomo no Ame to Yuki has recently posted a 90 second trailer for the movie, leveraging the viewers’ anticipation for this film.